Calcium Assay Kit (Fluorometric) ab112115 provides a simple method for detecting calcium in physiological solutions by using a red fluorescence probe. The fluorescence signal can be easily read by a fluorescence microplate reader at Ex/Em = 540/590 nm. The kit can be performed in a convenient 96-well or 384-well microtiter-plate format and easily adapted to automation without a separation step. The calcium assay can be completed within 30 minutes. The calcium assay kit can be used to detect as little as 0.03 mM calcium. The kit has a broad dynamic range (30 μM to 1 mM). This product is intended to be used in vitro with solution-based samples such as cell extracts. 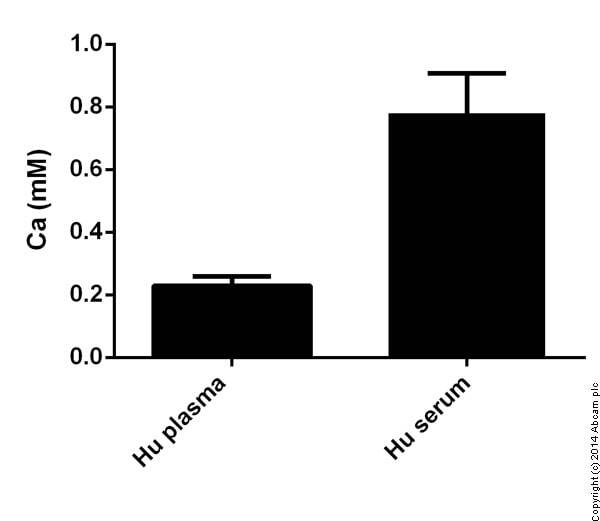 If you would like to detect calcium in vivo using live cells, please check our Fluo-8, Rhod-4 or Fura-2 based assays. Previously called Calcium Quantification Kit. Publishing research using ab112115? Please let us know so that we can cite the reference in this datasheet. Would you be able to tell me what is in the assay buffer/what kind of assay buffer it is, so I can make some? The assay buffer in ab112115 is 50 mM Na borate, pH = 8.5. Is the component B provided in the kit is needed to being able to see the fluorescence or is it just a dilution buffer? And if we protect from light it is possible to observe fluorescence 24h after the binding between Ca2+ and the red stock solution? Component B is a simple sodium borate buffer and therefore is just a dilution buffer. The optimum pH for this dye is pH8.5. It is quite stable as long as it is protected from the light so you should be able to observe fluorescence after 24 hours without any problems. Regarding the ab112115 kit, I would like to know if you have any idea if the fluorophore used in the quit absorbs to plastics. There is always some degree of non specific binding with the fluorophore and plastic of microwell plate. We are not aware if the interaction is chemical however we recommend our customer sot use negative controls in order to deduct the background staining due to non specific binding. 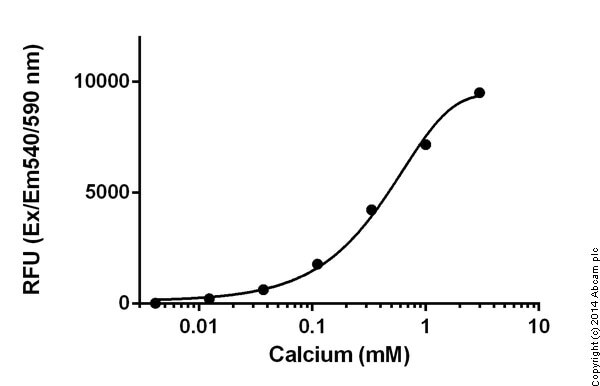 Regarding the ab112115 kit, I would like to know if you have any idea if fetal bovine serum might interfere in the measurement of the calcium in the sample solution, since some proteins from the serum can form complexes with calcium. Unfortunately we do not have any data to prove serum interferes with the dye. However, in order to overcome this problem you could add the same amount of serum as sample into the standard. I hope this helps. Please do not hesitate to contact us for further assistance. In regards to your questions, we would recommend freezing the stock solution instead of the reaction mix, however, there should not be a problem if it is stored at -20C and away from light for up to a week. Is there any interference when using an acidic pH? Malheureusement, le kit ab112115 ne devrait pas être utilisé dans un milieu acide. Un tampon acide pourrait conduire à des interférences et donc diminuer la fluorescence. Nous suggérerons aux clients d’utiliser ce kit à un pH optimal de 8,5 avec notre tampon à 50 mM. Vous pouvez commencer avec un pH de 6,5, en utilisant le tampon à une concentration d’environ 10 mM. Hi, I'm interested in using this Calcium fluorometer Ref.112115 in order to measure calcium gradient in medium and study cell chimotaxis. I'd like to know for how long does this product stay stable once you add it in the sample, I mean, how long can you wait to measure fluorescence once you introduce it in the sample. Thanks a lot! I have brought your question to the attention of the lab who have informed me that you can wait a few hours with no effect. thanks for your email and your support! So I take it that the presence of zinc would also contribute to the signal and ENHANCE the signal (and not reduce it, right?)? I had a look at the assay you’re mentioning… it seems it needs cells to work (some kind of activation process via cell esterases)????? This is clearly not what we’re looking for, since we are not working ith cells (simply Ca in solution). Would be great if you could confirm this. Yes, the signal would be expected to be enhanced in the presence of zinc. And in reply to your following question, yes the Fluo-8 (ab112129) and Rhod-4 (ab112157) would not be suitable for your samples. I am sorry for the confusion caused. Phone call enquiring after whether the Calcium Quantification Assay kit (Fluorometric) (ab112115) is likely to cross react with zinc ions. Thank you for contacting us yesterday in regards to the Calcium Quantification Assay kit (Fluorometric), ab112115. I now have some further information to share with you in regards to the kit. Unfortunately, I can confirm that the kit is likely to cross-react with zinc (as well as cadmium, mercury, lead and manganese). I am sorry but we do not currently have any kits available from our catalogue where this is not going to be a problem for you (I am confirming this with one final kit and I will get back to you with this information as soon as I have it). I can however say that the protein in your aqueous solution should not significantly affect the assay. As discussed over the phone, this kit can measure down to 0.03mM. If you are interested in detecting levels much below this I would suggest having a look at the Fluo-8 No Wash Calcium Assay kit (ab112129). This kit is able to measure much lower calcium concentrations (however, this kit will also pick up zinc). I hope this information has been of some help. If you have any further questions, please do not hesitate to contact us again.